Sourcetree is a great free git GUI client for Mac and Windows. A recent update (2.4) really broke my workflow however and it took me longer than it should have to figure out what the issue was. It seems Atlassian are enforcing a behavioural naming convention for ssh keys, which seems somewhat crazy. Rather than go through and change all my own naming conventions to align with theirs I simply created some symlinks. Problem solved. For Boolean to recommend a product it has to be pretty good. This is one application that gets installed after each and every Windows reinstall, – and it is especially useful for those of you still using WindowsXP. Boolean is in no way affiliated with the developer, – we just want to share a software gem with you. 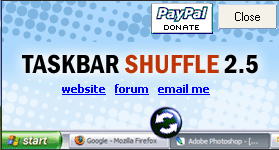 If you run more than a few applications at a time, you’ll definitely find Taskbar Shuffle useful, so give it a try!